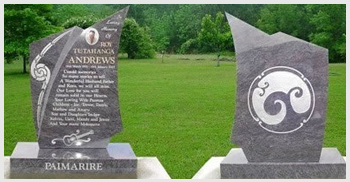 Grahams Headstones and Memorials, Tuakau, can help you if you are looking for a quality headstone or memorial.We can design a headstone or memorial specifically to suit your loved one. And we capture the deceased’s individual personality. See our range of headstones and memorials at our new showroom at 52 George Street, Tuakau, talk to our friendly, helpful staff, or ask for a free quotation.Phone for personal consultation on 09 236 8919 or contact our Monumental Mason, Ivo Solleder to discuss your needs. Grahams Headstones and Memorials works in association with Grahams Funeral Service, which offers you guidance and support during the difficult time when you have lost a loved one.